MONDAY, NOV. 26 (UPDATE WEDNESDAY, NOV. 28): HSBC Bermuda has been named the title sponsor for the Bermuda Marathon Weekend in January. HSBC’s sponsorship includes the 10K run and walk along with the half and full marathons, which will be held January 19 and 20. Donna Watson, president of the Bermuda National Athletics Association said her organization “is excited to partner with HSBC Bermuda and would like to thank them for their support for the Bermuda Marathon Weekend. “At HSBC we take great pride in sponsoring events that provide the community with a world class experience. The marathon, half marathon and 10K events last year had over 1,600 runners and walkers participate, and race director Anthony Raynor is looking to grow those numbers. 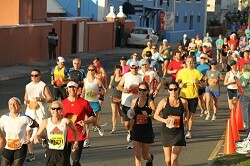 Registration for the 2013 Bermuda Marathon Weekend is now only available online at www.bermudaraceweekend.com and applications are open until 11:59pm on December 31. All event information can be found on the website including registration, course information, start times and race results. There will also be a health & fitness expo at the Fairmont Hamilton Princess during Bib Number Pick-Up on Friday, January 18 between 3:30pm and 6:30pm and Saturday, January 19 between 11:00am and 5:00pm. The Bermuda Marathon Weekend also includes the KMPG Bermuda Invitational Mile events, to be held on Friday January 18, starting at 6:30pm on Front Street.